ON THIS DAY (November 18, 1942) ... In arguably one of the biggest upsets in college football history, Holy Cross descended on Fenway Park and humiliated the previously undefeated Eagles 55-12. The Crusaders took the initiative and pushed the Eagles into a corner and never let them out long enough to do any damage. Everything Holy Cross attempted worked perfectly and the Eagles couldn't do anything right. John Bezemes, Johnny Grigas, and Ed Murphy ran all over Fenway Park intercepting passes for Crusader touchdowns. It was a colossal reversal of form and it wasn’t encumbered by any fluke or any miscarriage of justice of any prank of fate. 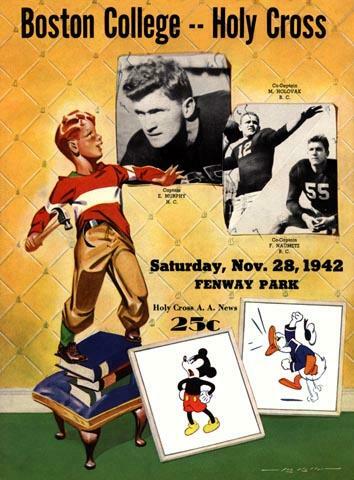 The young men from Worcester simply left the wreckage of the Boston College line all over Fenway Park. The Crusaders advanced like a forest fire all the day. They scored eight touchdowns, five by running and three by forward passing. Capt. Eddie Murphy converted seven of the eight gift points, and led his team as few Holy Cross teams have ever been led. It was one of those things you had to see for yourself to really believe. It was the rabbit turning to pursue the wolf. Veterans of the bleak midfield press box, on the lip of the ball park roof, were stunned and at a loss to explain the 1-to-14 long shot turning with a snarl and tearing the favorite limb from limb. And the 55 points were bombed through and over a team that for eight games had led the nation in total defense, as well as offense and topped the Associated Press poll. It was a first-class job of house wrecking. A sell out crowd of 41,300 saw Holy Cross completely obliterate any chance at all of the Eagles going to the Sugar or any other bowl by scoring in the first five minutes of play, piling up a 20-6 lead at halftime and quickly amend a fourth and fifth touchdown after intermission. They saw the Eagles, paced by the indomitable and more All-America than ever Mike Holovak, charge up and down the field only to stagger or stumble or fumble, or have the irrepressible John Bezemes intercept one of their passes. Holy Cross never let up from the time Bobby Sullivan, sophomore fullback, made a fourth-down plunge for two feet after five minutes of play, catapulting into the B.C. end zone for the first points of the day, until Andrew (Bubby) Natowich skittered seven yards on an in-and-out tackle play and the eighth touchdown midway through the last period. Between those times Holy Cross went berserk. They started the game with a 47 yard scoring march with Sullivan putting up the first score. After the kickoff, the Eagles operated smoothly and swept down the field for 65 yards, with Mickey Connolly hitting Don Currivan on a 22 yard scoring strike. Tom Alberghini kept the Crusaders in the lead by breaking through the line and blocking Connolly's extra point attempt. Then Holy Cross put together a devastating series of trap plays and marched 62 yards in eleven plays to make their lead 14-6, when Johnny Grigas tossed a pass deep in the end zone over Bob Mangene into Johnny Bezemes' arms. B.C. came right back but lost Mickey Connolly, who hurt his shoulder trying to block the extra point conversion. Bill Boyce came in for the Eagles and lined a dandy down to Don Currivan down the alley, but Bezemes jumped out in front, grabbed the interception and ran it down to the B.C. 23-yard line. On the very first play, he hit Eddie Murphy with a touchdown score while the Eagles were still wondering what happened. The half ended with Holy Cross holding on to a 20-6 lead. Just after the second half kickoff, B.C. fumbled (one of their eight fumbles on the day). So Holy Cross had the ball back and Bezemes ran past Gil Bouley for 21 yards. Then Sullivan churned out 11 more and Bezemes hit Murphy at the B.C. 10-yard line. Johnny Grigas then swept around right and easily took the ball in, bringing the score up to 27-6. On the ensuing kickoff, Johnny Killea got smacked and lost the ball allowing Murphy to recover it back for the Crusaders. Grigas went for the same inside reverse that he had already just scored with, and it worked again to make it 34-6. The Eagles came right back. They marched 75 yards in eight plays right down the field. Now at the one yard line, Mike Holovak had the ball punched out his arms into the end zone, where Grigas recovered it for a touchback. Still in the third period Bezemes uncorked the greatest open field run of the day, a 67 yard cross country romp of an intercepted Eagle pass, to break B.C. 's back. Bezemes scored his third touchdown at the beginning of the fourth period on a perfect over-the-shoulder pass from Grigas. B.C. then drove down to the Holy Cross 22-yd line when they fumbled yet again allowing Broni Macy to recover for the purple gang. A Crusader pass interception set up the last touchdown. 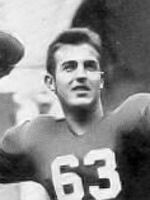 Bob Lawson batted down an Eagle pass into the arms of Macy at the Eagle 10-yard line. Two plays later Natowich cut over his right tackle to the corner of the goal. The final touchdown of the day came on a great play that will forever be lost in this game. Senior B.C. 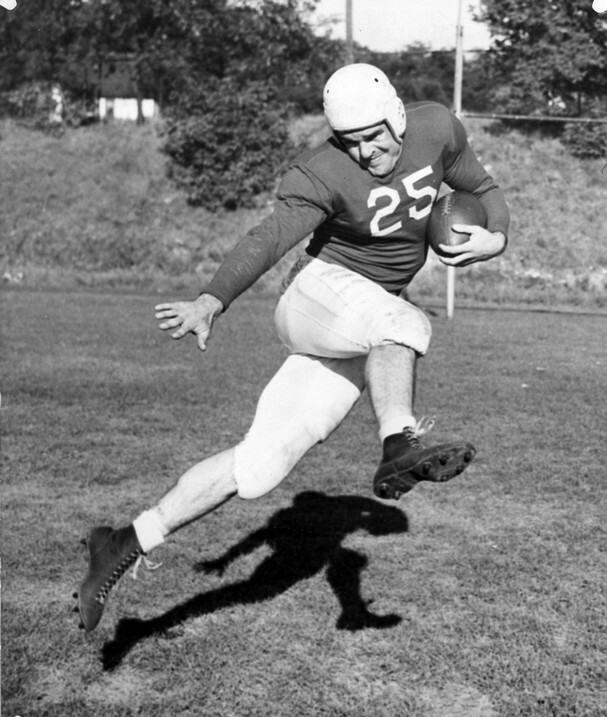 fullback unfurled a pass that traveled 57 yards in the air into the arms of freshman end, Chester Lipka who had outraced all the Crusader defenders, and caught the scoring bomb on the run as he crossed the goal line. Holy Cross played like Boston College was supposed to have played. That was Boston College, with its railroad and hotel reservations made, its travel itinerary planned and double-checked. It was Holy Cross that looked like the bowl candidate, the Crusaders who ran and passes and tackled and blocked like a Sugar Bowl team. As a result of the rout a Boston College bowl game celebration party scheduled for the Cocoanut Grove night club that evening was canceled. 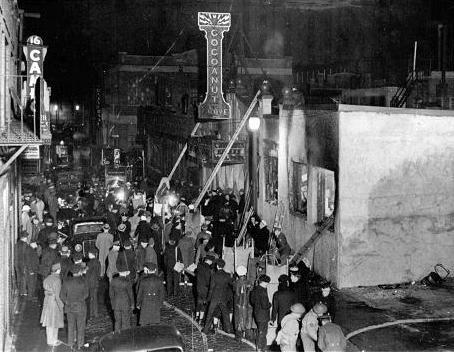 That night, the club was the scene of the deadliest nightclub fire in US history, killing 492 people (which was 32 more than the building's authorized capacity) and injuring hundreds more. It was also the second-worst single-building fire in American history. The enormity of the tragedy shocked the nation and briefly replaced the events of World War II in newspaper headlines. Most of those who lost their lives would have survived had the existing safety codes been fully enforced. The tragedy led to a reform of safety standards and codes across the country, and major changes in the treatment and rehabilitation of burn victims. Building codes were amended in the city and elsewhere. Revolving doors were outlawed (later reinstated when a revolving door is placed between two outward-opening exit doors). Exit doors were to be clearly marked, be unlocked from within, and free from blockage by screen, drapes, furniture or business supplies. Use of non-combustible decorations and building materials was ordered, as was the placement of emergency lighting and sprinklers.